Radical Victorian reformer Henry Mayhew walked the streets of London interviewing ordinary flower girls, market traders, piemen and costermongers to create the first ever work of mass social observation, and the ultimate account of urban life - including an extraordinary description of the city from a hot air balloon. Mayhew writes passionately of his Victorian London, throwing off the stereotypes, and presenting us with a realistic picture of the poor, their daily lives and struggles, and their entertainment in the penny gaffs. As someone who is generally fascinated by books detailing this era, Mayhew's descriptions were valuable and interesting to me, despite being dull to some. The price of street pies, the methods of catching and selling birds, the profits made by such endeavours, and the ways in which these profits were spent on necessity or pleasure, all delighted and enthralled me. They showed me the real Victorian London, and helped dissolve any preconceived fantasies. It's clear Mayhew had sympathy for the lower classes, and had aims to highlight their struggles through his work as a journalist. Compare that to how the poor are depicted in our media today, and it seems we've gone backwards rather than forwards in the past 150 years or so. It's a sad thing to contemplate, but definitely something to hold on to. 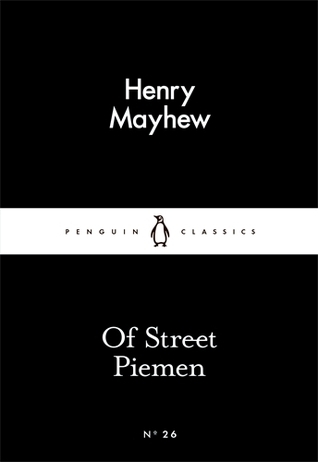 The atmosphere Mayhew weaves into his observations creates a real gloom to London, but a gloom with a certain purpose. Although his accounts of the people were relished more by me, his detailed explanations of the city's aesthetic, whether from a fast train, a high balcony, or a soaring hot air balloon, were completely gorgeous in their originality. I'm no Londoner, but I can only imagine the joy I would feel had Mayhew written of the streets I travel on every day, and imagining them bustling with the street markets, flower girls, and pie sellers of the era. A truly gorgeous collection written with a keen fondness for his city; this was my first foray into Mayhew, but I'll definitely be picking some more up as soon as I can.